Daughter of a jeweller. Soon after she was born her parents were divorced and she lived with her mother. After some financial struggles her mother was able to send her to school in Wiesbaden, where she learned German and French. When she was fifteen she entered the Royal Academy of Music and with her sporano voice she soon won several prices. Allthough she was a talented singer she decided to be an actress and in 1887 she made her professional debut. For five years she worked for the company of Herbert Beerbohm Tree. In 1890 she married the actor Fred Terry. They had a daughter, Phyllis (1892-1977), and a son, Dennis, who also became actors. From 1900 until 1930 they worked together both on the stage and in theatre management. In 1932 her son died in Rhodesia and in 1933 her husband passed away. In 1935 she left the stage, but she briefly returned in 1944, next to her daughter Phyllis. 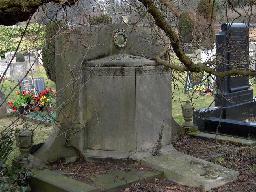 The grave of Fred Terry and Julia Neilson at Hampstead Cemetery, Fortune Green Road, London.